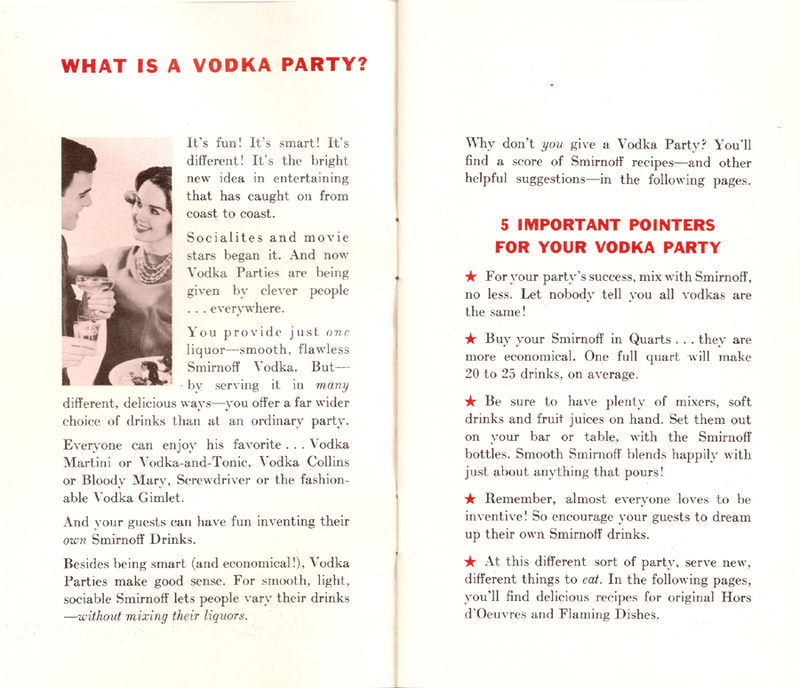 How to give a Vodka Party - The magnificent promotional pamphlet that inspired this blog. It captures the essence of late-50s/early-60s striving for sophistication that seems quaint and kooky today. Beautiful design, crisp and involving copy, and a bar-full of classic cocktail and hors d’oeuvres recipes. Scroll down to learn How to Give a Vodka Party now. Estimated date of publication: 1959. 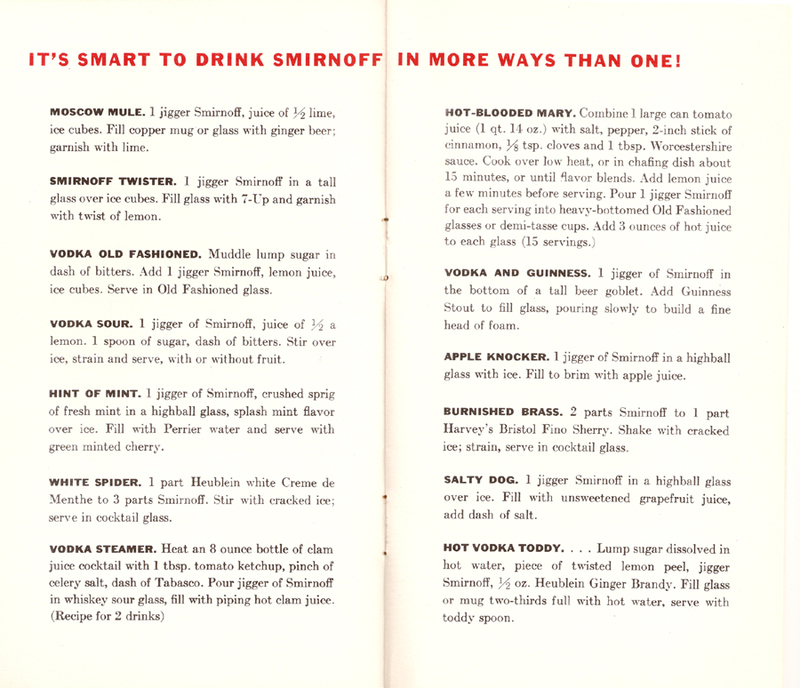 There is no publication date on the pamphlet, but I date it to around 1959 as Smirnoff was running a Vodka Party-themed print ad campaign in The New Yorker and other publications in May of 1959. 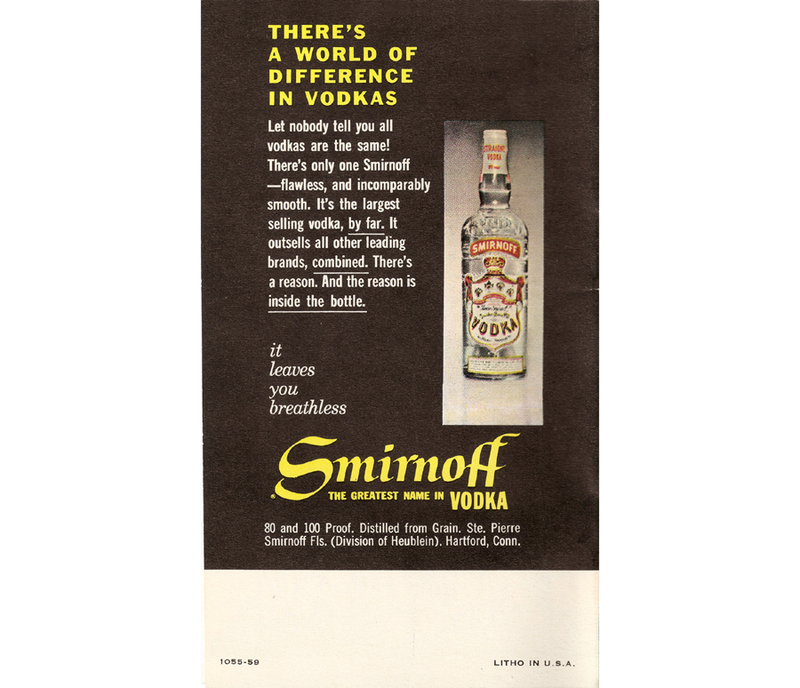 And is it just me, or is it suspicious that in 1959, at the height of the cold war, Smirnoff, the makers of a “Russian” product would argue against freedom of choice? While it might be smart and economical not to allow your guests to “mix their liquors,” it just seems un-American. But “not to worry,” the degree of creativity in terms of drinks, snacks and party ideas shows enough good-old American ingenuity, that any vodka party will be strictly red, white & blue. 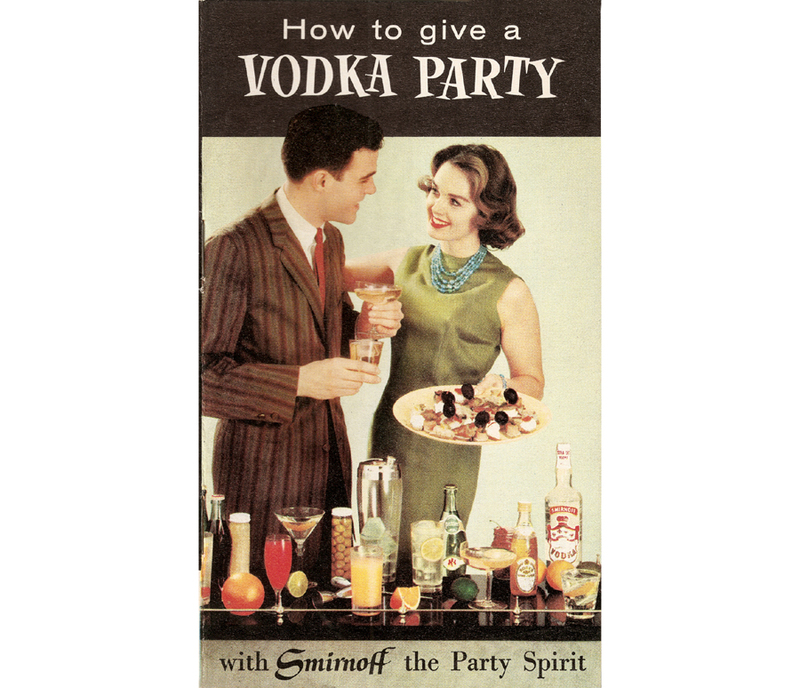 And one more thing: a sixth pointer for your Vodka Party…have a designated driver standing by, or preferably several. Simply review the names of the various drinks and you’ll be instantly transported back to a time of smooth “cool” with Sinatra crooning in the background as guests in party dresses and pencil-leg pants make mildly risqué smalltalk. And regarding the Vodka Martini, the recipe isn’t much help. You’ll need to make the call: Shaken or Stirred. Recipes include: Vodka Martini, Screwdriver, Bloody Mary, Green Dragon, Vodka Collins, Vodka Gimlet, Vodka And Tonic, Vodka-On-The-Rocks, Bullshot and Smirnoff Highball. After a review of the all-time classic vodka cocktails, we now move on to a roster of drinks for the more adventurous. I’m intrigued by the Vodka Steamer as I’ve always been drawn to beverages that mix shellfish products and alcohol. One word of caution: imbibe these cocktails at the risk of being labeled a non-conformist. Recipes include: Moscow Mule, Smirnoff Twister, Vodka Old Fashioned, Vodka Sour, Hint of Mint, White Spider, Vodka Steamer, Hot Blooded Mary, Vodka and Guinness, Apple Knocker, Burnished Brass, Salty Dog and Hot Vodka Toddy. “I can resist everything but temptation” – Oscar Wilde. I bet he wouldn’t be tempted by the broiled anchovies. All kidding aside, the recipes here are mildly tempting. 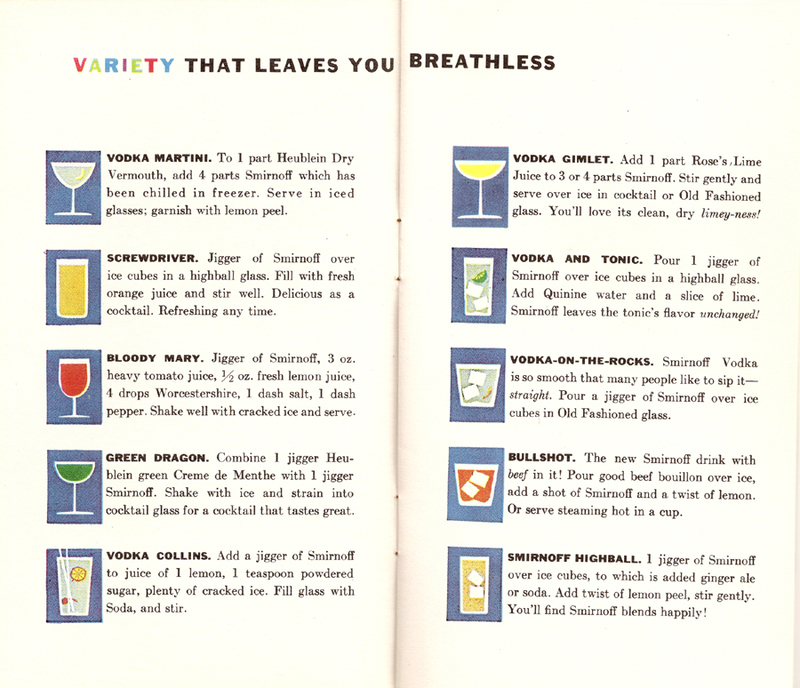 As with the cocktails, we see the safer choices on the first recipe spread (the wacky ones follow). None of these are going to raise any eyebrows. That said, the “naïve” style artwork does more than justice to these old (mostly) favorites. 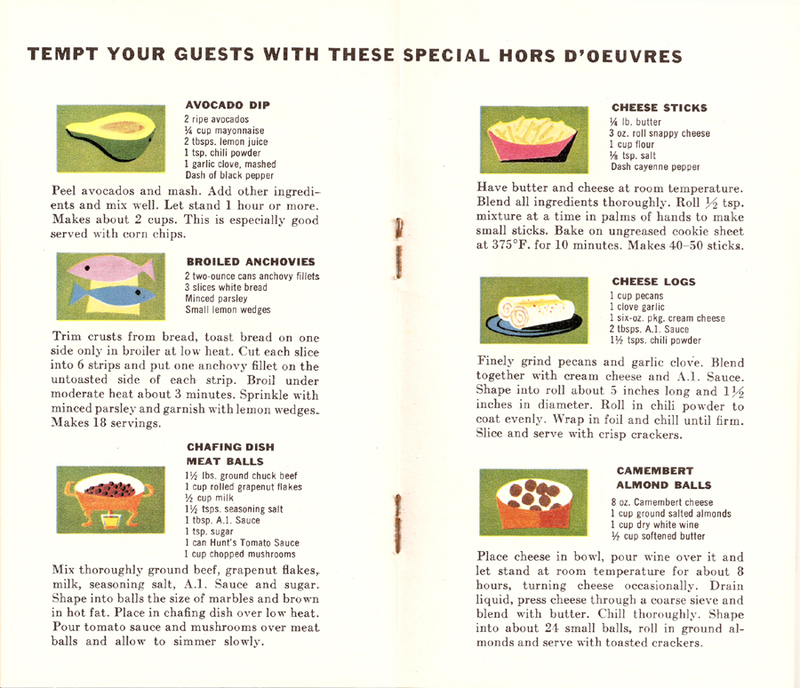 Recipes include Avocado Dip, Broiled Anchovies, Chafing Dish Meat Balls, Cheese Sticks, Cheese Logs and Camembert Almond Balls. Now the snack table is starting to get interesting. I’m not sure if the recipes are organized in chronological order with the wild and woolier dishes to be trotted out after the guests have gotten a bit more liquored up. It sure seems that way. I’m both attracted and appalled by the “Conversation Piece.” It starts out as a fairly neat and conventional dish of cream cheese and sauce, but as the night goes on it degenerates into a wild mix of the ingredients as the increasingly-plastered party-goers dig in with greater aplomb. I wonder if this is some sort of abstract representation of the human landscape of The Vodka Party as drinks are downed and inhibitions go out the window. 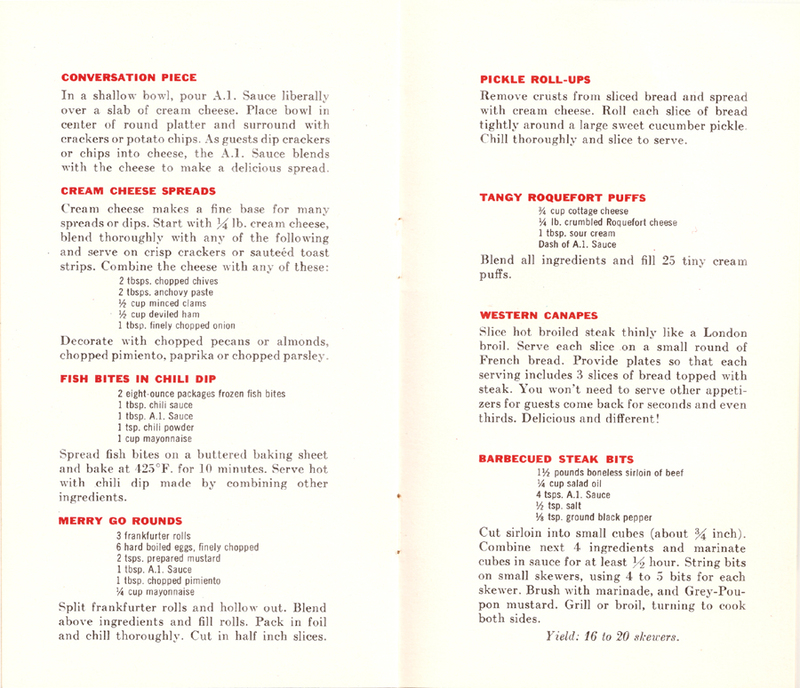 Recipes include: Conversation Piece, Cream Cheese Spreads, Fish Bites in Chili, Merry Go Rounds, Pickle Roll-Ups, Tangy Roquefort Puffs, Western Canapés and Barbequed Steak Bits. But throwing caution to the wind (a little too much vodka will do that), let’s light some food on fire! The fruit recipe sounds acceptable, but torching some plain-old roasted chickens seems slightly mundane. But, then again, I can see the guests’ faces “light up” as you sashay into the room carrying the blazing platter. It’s all in the presentation. And is lighting smoked turkey on fire adding insult to injury? Remember, Ben Franklin proposed the Turkey as our national symbol. Final Flambe Do’s and Don’ts: DO: Dazzle their eyes DONT: don’t singe their eyebrows. 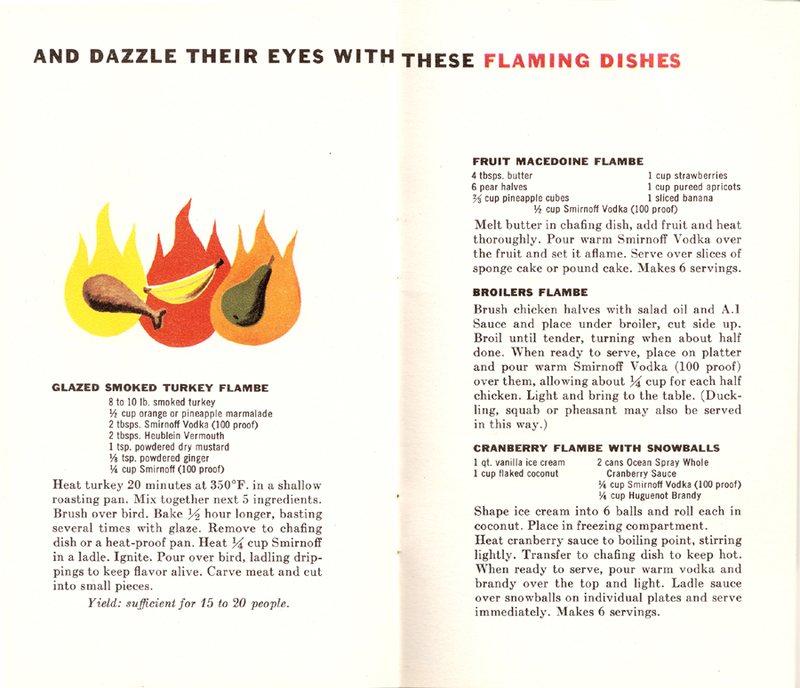 Recipes include: Glazed Smoked Turkey Flambe, Fruit Macedoine Flambe, Broilers Flambe, Cranberry Flambe with Snowballs. Now, assuming the house isn’t surrounded by fire engines shooting streams of water into every window comes the best part of The Vodka Party, the “Oddball” contest. The timing of this is an interesting conundrum…too early and the guests won’t be “loose” enough to come up with anything creative…too late and the “Oddball” names will be uttered as unintelligible slurring. In any case, the “Oddball” contest sounds like a fun idea, but I fear it could spin out of control. Without the safety net of trained mixologists (like the ones who developed the cocktail recipes in the pamphlet), things could quickly go to a very bad place. I somehow picture very strong drinks spiked with shudder-inducing ingredients. And the idea of failed experiments being unceremoniously ditched into potted plants offends my aversion to waste (especially of good liquor). 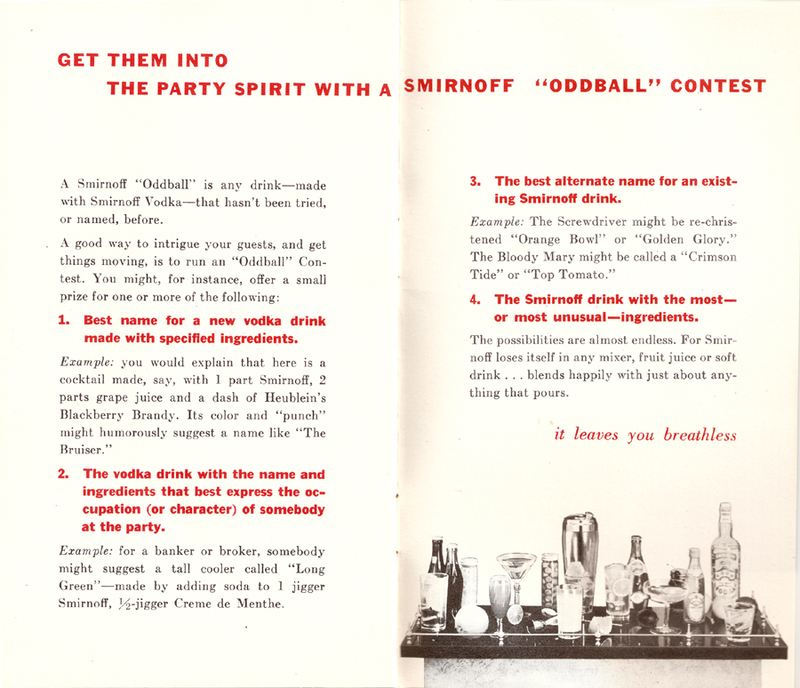 My “Oddball” Entry: THE TIME MACHINE: Send your guests hours into the future with a heady mix of Vodka and Alka Seltzer. They’ll thank you for it. To end The Vodka Party, Smirnoff resorts to a “size matters” pitch. Since Smirnoff outsells “all other leading brands combined,” it must be better. But they didn’t need to go there; The Vodka Party shows that in terms of wild, vodka-fueled fun and games, Smirnoff is number one.